Parmin’s life did not turn out the way she had wished. She was married off at the tender age of 15 years, bore two children, and was a widow at age 22. Her entire world had been torn apart. She was brought up to believe in the ideals of motherhood and the sanctity of marriage. Widowhood, hence, has had a brutal and irrevocable impact on her and the children. “Soon after my husband’s death due to lack of treatment for cancer , my in-laws took away everything from me. I had been married for eight years. My children and I were evicted and chased off. I lost everything -, my sanctuary, my refuge, my house and my home. I had no choice but to return to my aging father’s house.” Parmin did not return to the comfort of the home she had grown up in. Nevertheless, her father and brother, both migrant unskilled workers in Afghanistan, offered her the solace and moral support that she needed to move on in life. Parmin was fearful of having to endure the hardships and social stigma attached to widowhood. In South Asia, widowhood is associated with dishonour and shame. She belonged to a small village, Derai Bazar, on the border of Mohmand Agency where, like in most other traditional communities, widowhood represents ‘social death’ for women. Parmin, in the prime of her youth, sat on her bed with a sad look, which reflected grief, loss, and ill health. She had been consigned to the margins of society where she suffered from extreme forms of discrimination and humiliation. Parmin presented at Lady Reading Hospital with pus discharging from a wound caused by an earlier chest intubation: she had earlier developed pneumonia, which had led to pleural effusion. The pneumothorax, an abnormal collection of air or gas in the pleural space separating the lung from the chest wall, interfered with her breathing. She could not bear the acute chest pain and shortness of breath. She was immediately admitted to the Thoracic Ward of the hospital for a decortication. 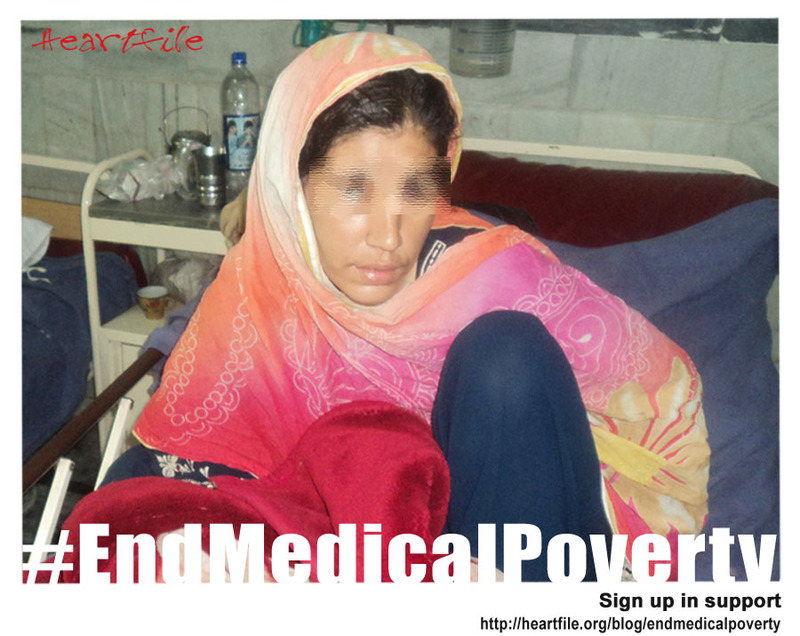 Parmin lacked the means to obtain appropriate health care or any other form of support; her treatment, which cost Rs. 24,407, was fully paid by Heartfile. The loss of her husband and companion deeply grieved Parmin, while the illness aggravated her financial problems. Continuing stress caused Parmin to go into a state of depression. Poverty, for her, did not just mean lost income, but also loss of peace of mind. She saw herself as a burden on her elderly father, and knew that she would have to endure extreme poverty, ostracism, and discrimination under the law, customs and traditions of the area. Parmin was aware that she was destined to lead an unprotected life, given that the lives of widows are determined by patriarchal interpretations of local traditions, customs and religion. The only protection she had was that of her father. The day he died, she would be deprived of all safety and security. This case highlights two common experiences of widows across the globe: loss of status and deterioration of financial circumstances. Parmin’s dream of a satisfying life had been shattered. She found it difficult to handle the loneliness and despair caused by rejection from the society, but struggled to regain her health to be able to take care of her children. Even before Parmin’s widowhood, she belonged to one of the poorest and most vulnerable of social groups. She is likely to end up as another unnoticed woman, secluded and excluded. Her case highlights more than just the stigma attached to widowhood; it shows the despair of an ailing single mother, the plight of a poor father, his anxiety in witnessing the deteriorating health of his widowed daughter at a tender age, and the total lack of support in Pakistan for single parents, specially women.